A COUNTY Offaly community is still said to be in shock today after a late night incident saw Hi-Lows guitarist Declan Nerney drag an innocent sheep onstage before proceeding to bite its head off, in what is being hailed as one of the most disgusting performances the county has ever seen. 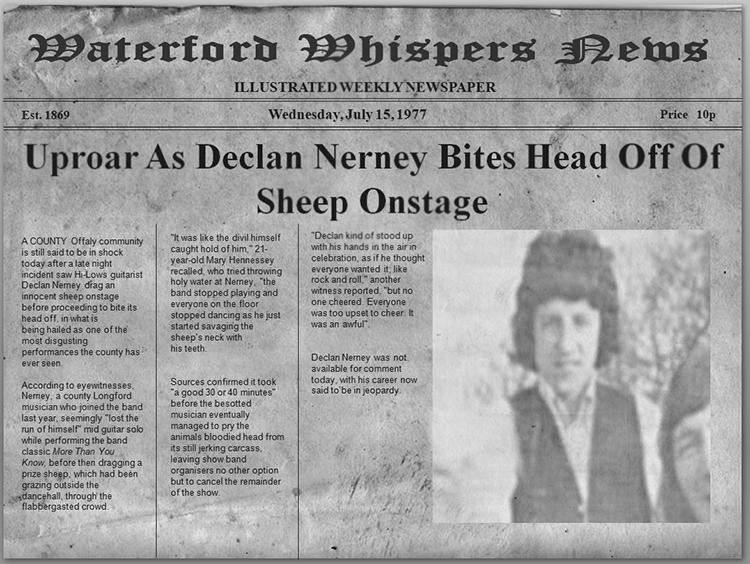 According to eyewitnesses, Nerney, a county Longford musician who joined the band last year, seemingly “lost the run of himself” mid guitar solo while performing the band classic More Than You Know, before then dragging a prize sheep, which had been grazing outside the dancehall, through the flabbergasted crowd and onto the stage. “It was like the divil himself caught hold of him,” 21-year-old Mary Hennessey recalled, who tried throwing holy water at Nerney, “the band stopped playing and everyone on the floor stopped dancing as he just started savaging the sheep’s neck with his teeth. Sources confirmed it took “a good 30 or 40 minutes” before the besotted musician eventually managed to pry the animals bloodied head from its still jerking carcass, leaving showband organisers no other option but to cancel the remainder of the show. “Declan kinda stood up with his hands in the air in celebration, as if he thought everyone wanted it; like rock and roll,” another witness reported, “but no one cheered. Everyone was too upset to cheer. It was awful”. Declan Nerney was not available for comment today, with his career now said to be in jeopardy.